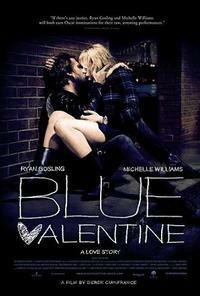 The second feature from Derek Cianfrance (his first being the 1998 low-budget Brother Tied), Blue Valentine depicts the dissolution of an unsuccessful romance. Or perhaps we should say: it depicts a successful romance, but also what follows that romance - a marriage. Focused on the young-ish couple of Dean (Ryan Gosling) and Cindy (Michelle Williams), the movie shifts back and forth in time between their initial courtship and what becomes of it six years, a child, and a reservoir of untold resentments later. This summary makes the film sound terribly bleak, and it does convey with brute force the toxicity of the later stages of this relationship, which had once seemed to promise so much. Feeling almost Cassavetes-eque at moments, the filmmaking often appears loose and spontaneous (some might say unfocused), the camera’s gaze being largely dictated by the movement of the leads, who in turn express with uncommon intensity their characters’ losses: loss of tenderness, of mutual understanding, of hope for the future. Certainly, there is bleakness in this picture. Perhaps unsurprisingly for an American film which sounds this dispiriting on paper, Cianfrance’s movie also comes with an abundance of indie credentials: it is named after a Tom Waits album; the two central performances are patently ‘method’ (Gosling and Williams reportedly lived as their characters during breaks in filming, with many scenes arising from improvisation); its soundtrack is provided by Pitchfork-darlings Grizzly Bear; it has a pointedly skuzzy poster (handwritten typeface and all)... This is the kind of context that can cause some reviewers to dub a movie “the perfect antidote to Hollywood’s usual empty-souled, assembly-line romances”. Yet in at least one respect there is something rather old-fashioned-Hollywood about Blue Valentine: it is, at heart, a romantic melodrama, concerned with what happens after a courtship. This kind of story is certainly far less common today than it once was, but its traditions run deep in popular cinema, having once been amongst the most successful of all genres. I will talk about this in greater depth in the Alternate Take, but suffice to say that in some ways, far from being a radical departure, Blue Valentine actually plays on some of Hollywood’s most fundamental romantic themes. And indeed, as in many Hollywood romance movies, these characters are dreamers who become faced with a reality that is harsher than their dreams allow. Yet we as viewers are also permitted to see the times that encouraged them to dream - the moments of sweetness and optimism that characterised the beginning of the relationship. This is what stops the film from being unrelenting in its misery, and what makes it feel closer to a lament than a howl of pain. The film’s central theme of becoming painfully but touchingly disillusioned in a belief in the future is itself literalised in the tacky space-age décor of a themed hotel the couple visit. An artistic conceit at once too bluntly symbolic and saved from banality by its vividness, the ‘Future Room’ might in fact stand as something of a synecdoche for the pleasures Blue Valentine offers. Some may find the movie too on-the-nose in a number of respects: the carefully arranged dual time-frame structure, the occasionally overbearing uses of music, perhaps even the excellent but award-welcoming performances. Without a doubt, there are times when bum notes are hit (one secondary character from Cindy’s workplace in particular strains dramatic credibility). But while 'love fades' is hardly a profound thesis, it is a potent truth, and is delivered here with a conviction and sincerity that ensures it also feels a poignant one. The precariousness of the movie’s balance on a precipice of obviousness might itself merely be a byproduct of this film’s desire to say something honest about its subject; few things can make us look more foolish than love, and few topics are harder for fiction to treat without appearing foolish itself. By no means a perfect film, this is nonetheless a rather beautiful one. This review was published on January 26, 2011.